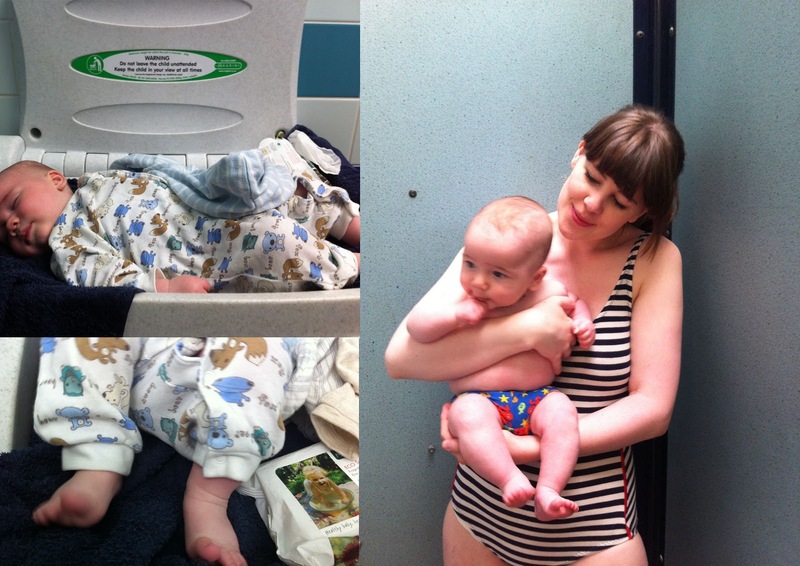 I am kinda embarrassed that Wilf is 14 weeks and has only now just gone to the swimming pool for the first time. For someone who loves swimming and believes in the importance of swimming lessons and introducing babies to water as soon as possible, this is actually quite late. So being half term I called the pool in advance to make sure when the flume was open (in order to avoid it) and made sure we ready to leave for 11am. 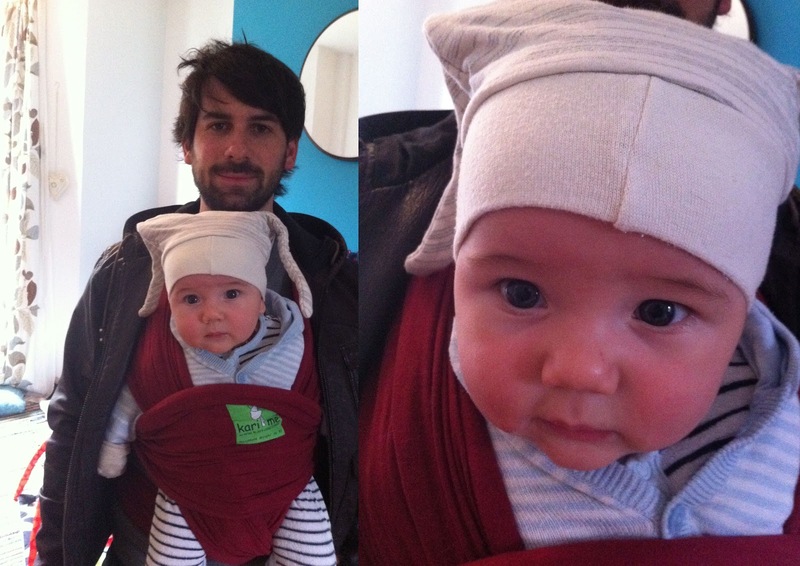 Tom strapped Wilf in to the sling in the forward facing position (which he much prefers as he is able to see whats going on) and we set off. Our local pool has family rooms so I was able to get Wilf dressed whilst Tom changed and then he could take over whilst I did. Wilf loves being naked so I knew this part would be fine but I was a little worried about the temperature of the water in the pool. Wilf and I have gotten used to sharing baths together but they are always the maximum of the temperature recommended for babies (38degrees) as I hate a tepid bath! The water was a little on the cool side as the baby pool is right by the large single glazed windows but Wilf loved it. He was kicking his little legs madly and grinning and chuckling. Tom and I took it in turns to wizz him through the water and bob him around. There was another little baby (4 and a half months) there with his dad and he chatted to us about how his wife had just started talking him to Turtle Tots and how much he enjoyed it. The classes are on the pricey side but I think it will be worth it. I used to swim a lot when I was younger (around three times a week) I did synchronised swimming and swam for a local team (breaststroke). It was a bit weird entering the pool as I realised the last time I had been was the day before Wilf was born (and about 12 hours before going into labour!). We got ready to go after about half an hour, Wilf was so tired that he fell asleep as I was changing him! We also realised the spare change of clothes we had brought him (he soiled the first grow on the way there) were footless and we were carrying him in the sling. Instead we put his gloves on his feet and put the sling over his feet. 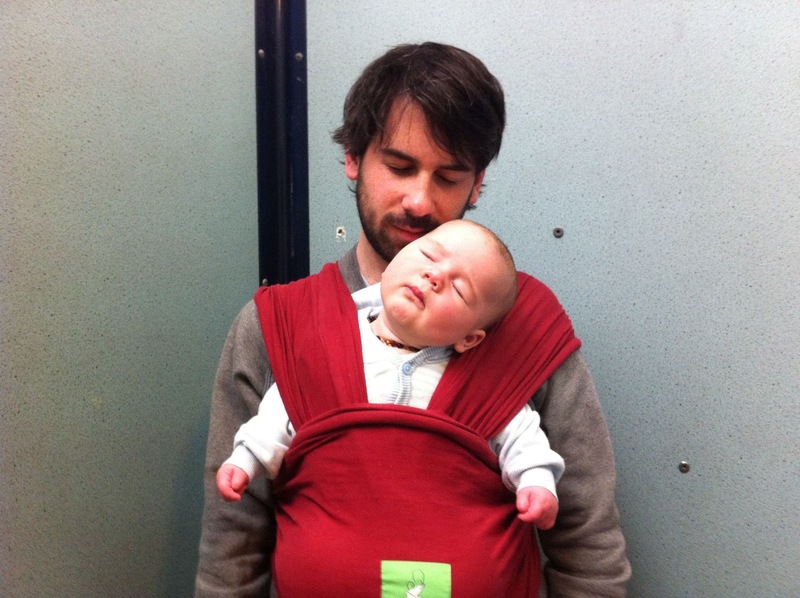 He wouldn't even wake as we squeezed him in the sling, he then went on to sleep for most of the afternoon! It was such a lovely family activity Im so glad we got round to it. Also as the weather is getting better we are thinking of getting the birth pool out in the garden for some pool time! awwww so glad he enjoyed, swimming really wears them out. Turtle Tots sounds like great fun! haha. That last picture is lovely!